Nonprofit Consulting Archives - The Jackie Sherman Group, Inc.
One of Atlanta’s largest and oldest synagogues had experienced five years of declining membership, decreasing participation in services and other activities, and related financial difficulties. Although a strategic plan had been developed in the past, it was never implemented. This planning process was different, the plan has been implemented, and the synagogue has revitalized. Working with its leaders we developed and implemented a synagogue strategic planning approach that involved the entire congregation. All members were invited to communicate their needs and engage in developing innovative approaches to revitalization. The participants were so enthusiastic that positive changes began even before the plan was officially adopted. After the first year of implementation, membership increased, programming expanded, and the religious school was revitalized. Participation significantly increased across all areas of synagogue life, finances improved, and there was broader participation in governance. 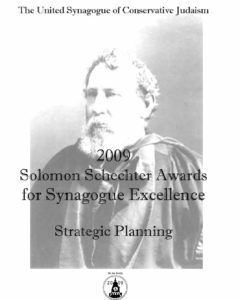 This planning process and the resulting plan won the Conservative movement’s Solomon Schechter award in 2009. Eight years after completing its planning process this synagogue continues to thrive.